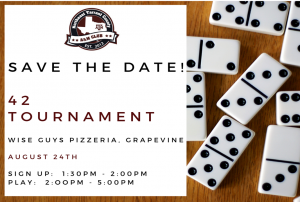 The third (almost) annual NETC A&M Club 42 Domino Tournament is currently being planned for August 24, 2019 at Wise Guys Pizzeria in Grapevine. Over the last two tournaments we have raised nearly $1000 which is equal to one of the club’s normally awarded semester scholarships. Keep an eye on this page and social media for all the details as plans are finalized. We look forward to seeing as many teams as possible shaking the bones and raising money to help local students attending A&M.